Flickr doesn't make it as easy to download photos in bulk as it does to upload them which is where FlickrDown comes in. This handy program helps you download multiple Flickr photos in one go. All you need to do is specify a username or email address that you want to search for photos under and then select the ones that you want to download. You can download them as photo sets, pick-and-choose individually, or even download all publicly accessible photos. If you're a Flickr addict or a fan of one particular user's photographs, FlickrDown makes it a snap to complete your desktop photo collection. 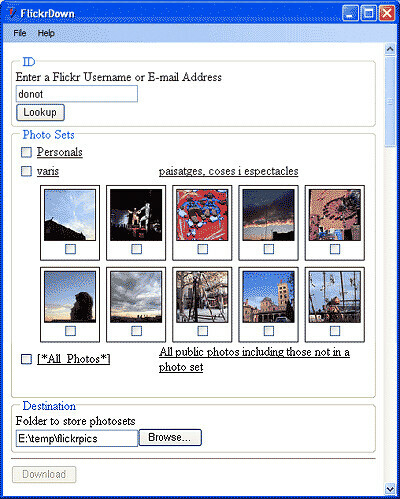 Of course, you can also use it to backup your own Flickr photos.